Rolo (store bought chocolate/caramel candies), pretzels and M and Ms.
For these tasty treats, all you have to do is lay the pretzels on a baking sheet. Top each pretzel with an unwrapped Rolo candy. When you remove them from the oven, the Rolo will still be in the same shape as when it went in the oven. Place a M and M on top of the Rolo and press down a bit. Top each of the Rolo with one M and M.
Place the entire baking sheet in the freezer for about 5-7 minutes to allow the Rolo to cool. Of course, if you live in deep freeze like we do in Canada just place outside for until set. It’s that time of year again. All the supermarkets in the States are stocked with pastel colored marshmallow bunnies and chicks. Most people call these “peeps” and whether they end up in someone’s Easter basket or in someone’s desk for snacking; they always seem to be very popular. They’ve been brightening springtime for over a half century. Love this one . . . I had more than a few folks suggest that this year's quiz was more challenging than previous editions. Not sure about that, it wasn't planned . . . perhaps it is just the quetsions that popped into my mind. Anyway, without further blathering . . . here are the answers. 1. Who was the first Canadian in space? 2. Which hockey star's suspension led to days of riots in Montreal? 3. Name the Canadian physician, medical innovator, and Chinese national hero best known for his service in the Spanish Civil War and the Sino-Japanese Wars. 4. In 1980, Terry Fox set out to run across Canada to raise money for what disease? 5. Officially credited with 72 victories, this First World War flying ace recently became the namesake of Toronto's island airport. 6. In the 1960s, Canadians Ernest McCulloch and James Till were the first to demonstrate the existence this type of cell, capable of differentiating itself into a diverse range of specialized cell types. 7. Name the American slave who fled to Canada and established a community for fugitive slaves near Dresden, Ont., and who is said to have inspired the title character of Harriet Beecher Stowe's Uncle Tom's Cabin. 8. Appointed in 1999, who was Canada's first Governor General to be a member of a visible minority? 9. What colour must Canada Number 1 maple syrup be? Canada No. 1 maple syrup is usually intended for table use and is divided into colour classes extra light, light and medium. This classification of syrup is the palest coour and generally has the mildest flavour as well. 10. Who was the first Canadian chef to win Iron Chef America? 11. What Canadian province is home to more than 100 cheesemakers? 12. Which Canadian artist or band was the first to take the number 1 spot on Billboard's Top 100? 13. In what year did the Canadian dollar reach its highest-ever value against the U.S. dollar since the Bank of Canada's founding in 1935? 14. In what year was Canada added to China's list of approved tourist destinations? 15. Which Canadian city became the world's first to use the 9-1-1 emergency response number in 1959? 16. Which former Quebec premier would allegedly buy votes using whiskey, food and appliances? 17. On the list of top 10 countries, ranked by land mass, what spot belongs to Canada? 18. In what year did slavery become illegal in Canada? 19. When did the maple leaf become the official emblem of the Canadian flag? 20. In what year did Canada adopt the $ 1 coin (also known as the 'loonie')? 21. In what bay are the highest tides in the world experienced? 22. Which prime minister, accused of public drunkenness after vomiting during election debates, claimed: "I get sick sometimes not because of drink or any other cause, except that I am forced to listen to the ranting of my honourable opponent. 23.What was the name given to the victims of a scheme that saw several thousand orphaned children falsely determined to be mentally ill by the government of Quebec, and confined to psychiatric institutions? 24. What three oceans border Canada? 25. What was the name of the war that saw the United States attack and invade Canada, only to be defeated at the hands of the British and Canadian troops. War of 1812. Interestingly, American history students are taught the the US won the war - strange when they invaded Canada and left without gaining any additional territory at all. Instead, Canadian and British troops captured Washington and burned the White House to the ground. Come back on Sunday for the 4th of July US Trivia quiz! Have you voted in the photo contest? Four of our trip pictures have been entered in a photo contest run by the good folks at easycar.com. Oh happy day - all four photos are currently in the top 10 out of 370 photos. You can vote for each by clicking here, (remember 10 is a good vote! *smile*) here, here, and here. Yes, you CAN vote for all four photos. You can only vote once from any given IP address - this means you can vote once for EACH pic from both at home and at work! If you have two computers networked at home, you can only vote on one of them, however. If you have a Blackberry though, that is a third vote. If you send these links to friends, relatives, or people who bug you with unwanted e-mails - just think of the of votes! It boggles the mind. I delivered the 16 dozen cookies and squares to the successful bidders in our silent auction at work. They raised $ 120 for the charity so I was happy with that. 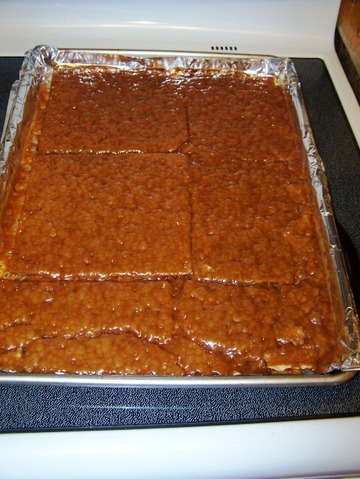 If you like a hard toffee with a hint of vanilla you'll purr over this! 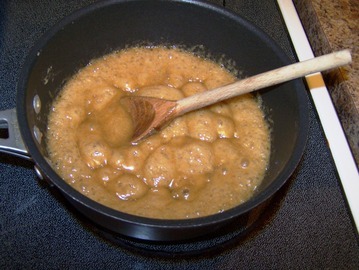 Combine sugar, butter, water, salt, and vanilla in a medium sized, heavy duty saucepan. Cook over medium high heat to 310 degrees on a candy thermometer, stirring constantly. 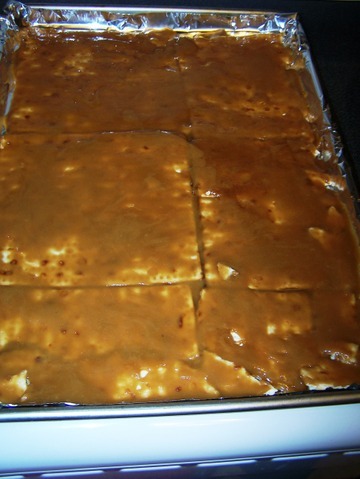 Pour into a foil lined and buttered 9X13 pan. 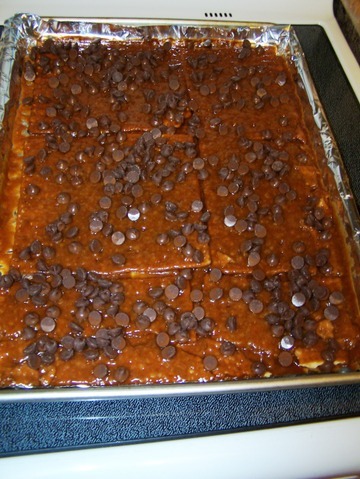 Sprinkle the chocolate chips on top of the toffee. Allow to sit for about five minutes. 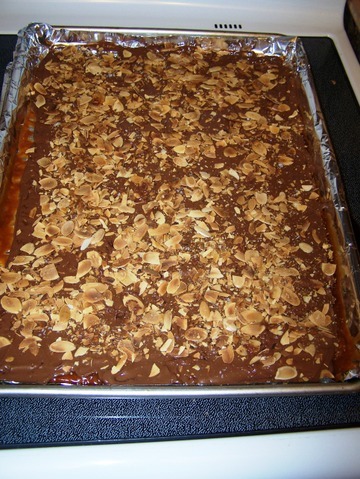 Spread the chocolate evenly on top of the toffee, sprinkle with nuts. Cool and break into pieces. Makes about 1 1/4 lb. Our photo is currently number 14 13 (woo hoo) out of 464 photos. I don't know about you but since I became an adult (I think it finally hit me a few months back) Christmas has become a lot of work. The past few weeks have been a blurr of shopping, cleaning, decorating, baking, and planning. I am always amazed at how much gets packed into such a short period of time! It is at times like this that I look for recipes like this one, simple, readily accessible ingredients, and destined to wow anyone lucky enough to try a sample. 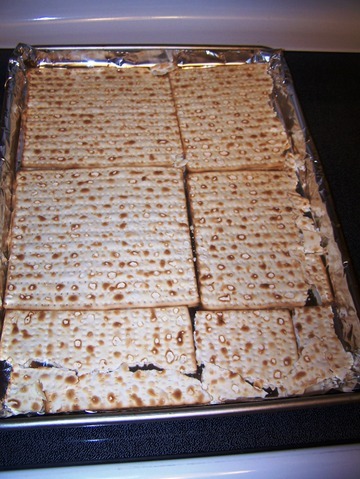 In fact, the most complex part for a non-Jewish guy like me was to find the Matzoh! I am so glad I got in touch with Judaism enough to find it in the kosher food section of the store. 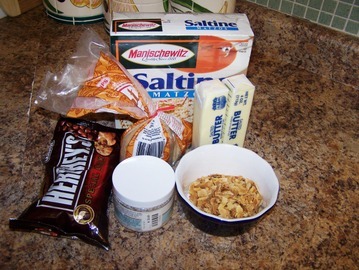 This recipe was posted by the chef, author, food blogger, and all around nice guy David Lebovitz. Now before you go all over me about copyright you should know that I asked for permission to post this recipe and he gave it (hence the all around nice guy comment). Line a 11" x 17" baking sheet completely with foil (making sure it goes up the sides) and preheat the oven to 350 degrees. 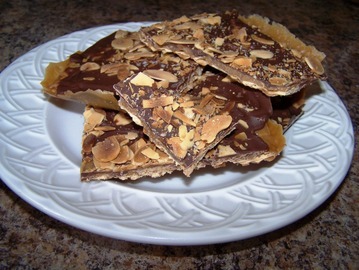 Sprinkle withfleur de sel or coarse salt, then scatter the toasted almonds over the top and press them into the chocolate. Let cool completely (you may need to chill it in the refrigerator), then break into pieces and store in an airtight container until ready to hand out to anyone you feel is truly deserving of an extra special treat.